No matter what other people think of you, you have to believe in your own abilities. Always do your best to show the world your uniqueness, the special person that you are. Every day when you wake up, promise yourself that you will do your utmost best, to make a difference in this world, because you believe that you have the ability to do just that. Have confidence in yourself. Believe that nothing is impossible with hard work, and a commitment toward your cause. Have hope that you will reach your lofty goals and dreams, because of the unique abilities you posses. In fact, you might surprise yourself, because you will be able to demonstrate your unique talents, some of which you thought you did not possess. When in difficult situation, remind yourself repeatedly that nothing is impossible, that ALL things are possible. No matter how big your challenges might be, always use your positive mindset, as well as the positive energy around you, and you will overcome anything that comes your way. The path to success will not be easy, there are many obstacles that will block your way, but you will overcome them all, because there is nothing that will stop you from attaining your goals and dreams. When you set your eyes on something, you will do your best to achieve it, because you believe in your abilities to make it possible. Success will take you through some twists and turns, and sometimes you can't see beyond the next bend in the road, but with hard work, and a consistent effort, there is nothing that will stop you from realizing your dreams. When you meet with failure, you will not give up. You take the lessons learned and move on. Failures will be your best friend on the road to success. You will bounce back stronger, because you know that you have the unique abilities to achieve your heart's desire. 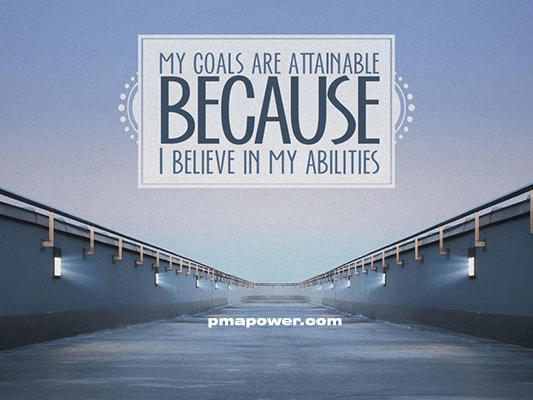 Starting today, know that all the goals you set for yourself are achievable. And how do you know? You know, because you believe in yourself, you believe in your abilities, and you know that nothing is impossible. Pursue your dreams with all your might, and know that you have the power to see your dreams become a reality. Believe in yourself! No matter what other people think of you, you have to believe in your own abilities. Always do your best to show the world your uniqueness, the special person that you are. Every day when you wake up, promise yourself that you will do your utmost best, to make a difference in this world, because you believe that you have the ability to do just that. Have confidence in yourself. Believe that nothing is impossible with hard work, and a commitment toward your cause. Have hope that you will reach your lofty goals and dreams, because of the unique abilities you posses. In fact, you might surprise yourself, because you will be able to demonstrate your unique talents, some of which you thought you did not possess. When in difficult situation, remind yourself repeatedly that nothing is impossible, that ALL things are possible. No matter how big your challenges might be, always use your positive mindset, as well as the positive energy around you, and you will overcome anything that comes your way. The path to success will not be easy, there are many obstacles that will block your way, but you will overcome them all, because there is nothing that will stop you from attaining your goals and dreams.